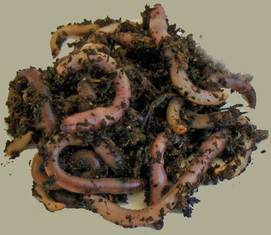 Looking for fishing worms or composting worms? 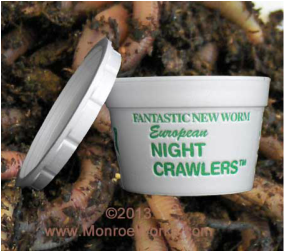 We have European Nightcrawlers for sale in cups and breathable bags. Red worms are for sale in breathable bags. Use either worm (or both at the same time!) for worm composting. 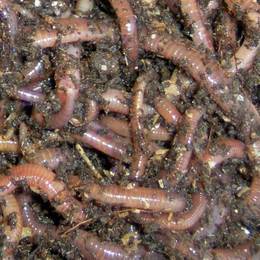 FREE Vermicomposting Guide emailed after your order of worms. We ship on ﻿Mondays﻿. Orders received Monday - Sunday will ship the following Monday. Shipping is by USPS Priority Mail. For overnight, please contact us. Refer to our "Shipping Information" for further information on policy and how to receive your worms. Bait Size European Night Crawlers in special cups with air holes along the lid. (24 Euro's per cup). Convenient for fishing trips. Take just what you need, the rest will keep for weeks in the cup without refrigeration (keep at 55-75, with 60 degrees providing the longest life.) Save going to the bait shop, always have fishing worms on hand, you can leave them in the cups without having to transfer them in a bed. Buy Red Worms - "Red Wigglers"